25th Anniversary Deluxe Edition 4 disc set! • Best Pop Performance by A Duo or Group with Vocal: "Losing My Religion"
• Best Short Form Music Video: "Losing My Religion"
The seventh studio album from R.E.M., released in 1991, propelled their status from cult status to that of a massive international act. The album topped the charts in both the U.S. and the U.K. The album features the hit Grammy-winning single "Losing My Religion" and "Shiny Happy People." Reviewing Out Of Time, Rolling Stone simply said, "This may well be America's best rock & roll band." Earlier this year, Pitchfork called the album "arguably their most important record," while Time Magazine named ‘Out Of Time' one of its All-Time 100 Albums, saying it contains "ethereal beauty rarely heard on a rock record." 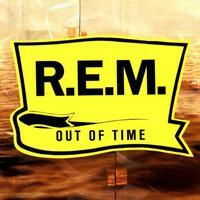 The 4-disc deluxe version comes with an additional live recording of a 1991 show at Mountain Stage and a Blu-ray disc that contains hi-resolution audio and 5.1 Surround Sound versions of Out of Time, all the album's music videos, and the 1991 electronic press kit "Time Piece" (a collection of studio and performance footage and more). The reissue will also come with liner notes by Annie Zaleski, featuring interviews with all four band members and the album's producers Scott Litt and John Keane.